It is believed the club was founded around 1851, although the exact date remains a mystery to us at present. There are some recollections and a few records of matches played on the field across the Migh Bridge on the River Chew. This location is just a few hundred yards from the present ground. There are also records of games being played beyond Tun Bridge on the south side of the village. It is said that teas were brought out on trays from the Fisher's Lodge. 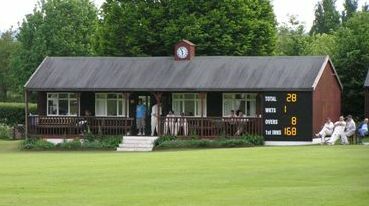 The club has played its cricket on the picturesque ground at Chew Court for almost seventy years since relocating in the 1930s. This is surely one of the best looking village cricket grounds to be found anywhere in the county of Somerset. Before the mid-seventies the club played only friendly games with local village sides. But from 1975 to the present day it has been playing Somerset League cricket with fixtures against clubs from all over the county. Over the past 30 years or so the club has tasted success in the league, the National Village Cup and the Somerset Knockout Competition, and rose to the Premier Division in the early eighties. Since then it has had a slight dip in its fortunes, but still maintains a good standard of play. In the past few seasons it has even managed to attract players from overseas to come and ply their trade at Chew Court. Needless to say they have all enjoyed the hospitality of this traditional village cricket club and returned to their native lands with tales of Adge Cutler and scrumpy cider! A move to the Bristol & District Cricket League in 2007 enabled the club to play fixtures a little closer to home. 5 years of B&D cricket finally resulted in a Championship winning side in 2012. In 2013 the club played its cricket in the West of England Premier League (WEPL), Bristol & North Somerset Division and were again League Champions. For the 2017 season, the club is playing in the WEPL Bristol & North Somerset division.